For those photographers who are trying to take their photographs to market there is a new ebook for you from the Craft&Vision folks. It is called Growing the VisionMonger 2, because it is the second in the series by Corwin Hiebert. Normally all their ebooks are $5 but currently you can pick it up for $4 or pick up both for $8. If you aren’t looking to sell your photographs but do want to improve your skills there are ebooks for that too so check out their library. Clicking on the image below will take you to the ebook offer. Why am I mentioning this you may ask? Because Corwin gave me the chance to contribute to this ebook in a small way. He asked a community of photographers a series of questions and chose what he felt would be helpful information to share with others. 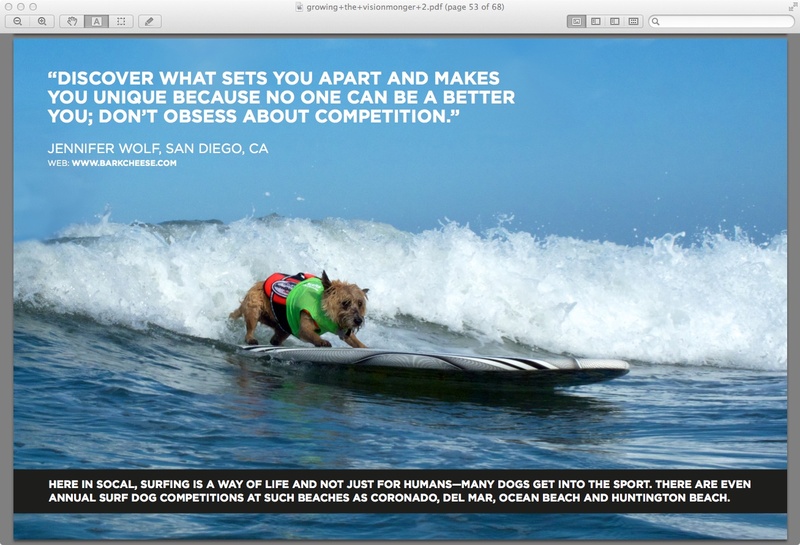 Image | This entry was posted in Business building, Pet Photography and tagged Corwin Hiebert, Craft&Vision, pet portraits, photography, Surf Dog, Surf-a-Thon. Bookmark the permalink.